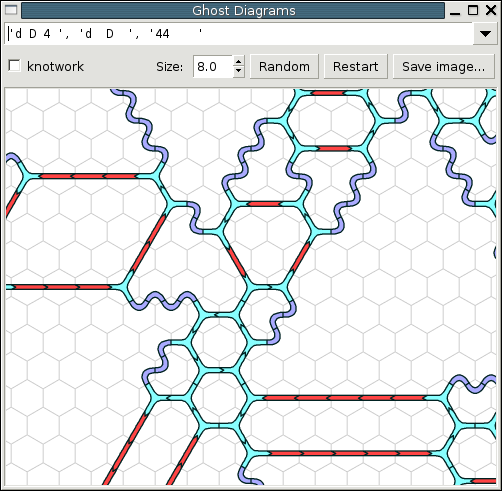 In several recent posts I’ve mentioned quantum issues, and the manner in which they relate to mediological and networkological concerns, in passing. But quantum physics is a body of knowledge much used and abused by those who like to speculate about the constitution of matter. And so, I’d like to put a little meat on the bones of these quantum references. Before doing so, however, its worth reviewing what the stakes are to mediological/networkological analysis (and for more on these approaches, please see What is Mediology? or Networkologies – A Manifesto). In a recent post called World As Medium, I argued, following Whitehead, that the world is a medium to itself, in that self-differing substance gives rise to a multiplicity of positions for its own self-experiencing. 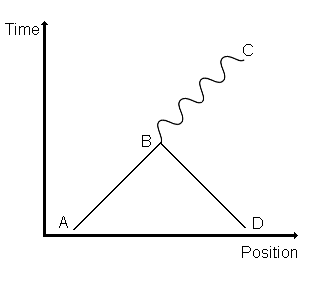 The ‘distance’ between these points are what Whitehead calls ‘extension’, and space, time, and spacetime are differing forms of abstraction thereof. Extension is then that which creates separate positions within experience, it is that which makes all positions upon the world non-identical. Quantum particles, however, seem largely exempt at small scales from the separations within extension – at least when they are in a pure, undisturbed state, one called coherence by most physicists. That is, until they decohere, quantum phenomena do not exist localized in space and time the way we normally think of large, or ‘macroscopic’ entities, as existing. One of the descriptions used to describe this state is that of smearing – coherent quantum phenomena are smeared over areas of time and space. This is why, for example, electrons are often depicted as clouds, in that it is only when these clouds interact with something else that they take up specific positions in space and time. Until that point, they float, are smeared, etc. Take your pick of metaphor, the point is, they aren’t anything near what we consider normal for objects we encounter in daily life. 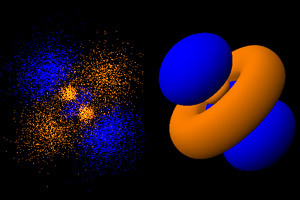 two depictions of electrons clouds in an atom. This distinction also gives body to the famous ‘wave-particle’ duality that high-schoolers are taught about the realm of the quantum. That is, when localized in spacetime, quantum phenomena behave as particles (as described by Heisenberg’s matrix-mechanical model), but at other times, like waves (as described by Schroedinger’s wave-mechanical model). Whether or not the quantum phenomena are smeared or localized depends on the extent to which they interact with each other. Large macroscopic entities, like dogs or chairs, of course, are made up of so many entities that it is impossible for quantum particles to remain in isolation, so they are continually hauled into the ‘actual’ world. Only under conditions of extreme isolation, or in the incredibly brief moments (if we can even call them that!) between encounters with each other do quantum phenomena delocalize. This is precisely why we don’t encounter things violating the constraints of spacetime on a more continual basis. Of course, under more extreme conditions, such as incredibly high gravity or incredibly high speed, the threshold level for these violations increases, such at ever larger objects can begin to violate the general laws of space and time, for it is precisely under these extreme conditions that, as many have said, space and time begin to ‘break down.’ Of course, for quantum phenomena, space and time are only part of the story. Whether or not the ‘cloud’ states of quantum particles denote probability or smearing, of course, is grounds for debate, depending on whether your approach to these issues is fundamentally oriented in an ontological (ie: Heisenberg, Bohm) or epistemological (Bohr) bent. For Bohr it is only that which is observed that is real, and thus, only the particulate nature of quantum phenomena can be said to truly ‘exist’ – the rest is only speculation (and Schroedinger’s equations, despite their use, are nothing but tools for prediction, rather than descriptions of some sort of ultimate reality). For Heisenberg and others, quantum ‘potential’ is in fact a very ‘real’ thing, a ‘virtual’ present and between the ‘actual’ of quantum events. [For an excellent analysis of the physics at work here from a Whiteheadian perspective, see Michael Epperson’s excellent Quantum Mechanics and the Philosophy of Alfred North Whitehead]. These positions in physics, between the epistemological skepticists and the ontological optimists, so to speak, roughly correspond to opposing viewpoints in philosophy. That is, in philosophy, we could roughly divide these two groups into the Kantian/epistemologists, and the Spinozist-Hegelian/ontologists, or use any other set of related distinctions between those who aim to limit thought to only that which can be seen, and those which feel that one of the primary functions of thought is its own self-exceeding. These debates are highly relevant to contemporary philosophy, particularly in its most recent manifestation as Speculative Realism. Such approaches generally reject the Kantian divide, particularly its anchoring within the subject of psychology and language, and attempt to reintroduce the metaphysical questions which were previously banished by Kantianism and its more post-structuralist re-incarnations. In particular I find Graham Harman’s object-oriented philosophy and Levi Bryant’s approach of onticology to be of enormous import in contemporary discussions over the notion of what precisely constitutes an object. And it is here where the concerns of contemporary philosophy and the realm of the quantum coincide. In order to go beyond mere invocations of the quantum, its worth going into some detail about precisely how it is that quantum phenomena exceed space and time, so let’s examine two particular quantum experiments famed in their ability to confound common sense – the EPR experiment, first proposed by Einstein and two lesser known colleagues (Podolsky and Rosen), and the more recent advent of quantum eraser experiments. While both of these began as thought experiments, both were eventually realized in laboratories, but sometimes much later than their initial theoretical formulations. a. THE SETUP: A gun shoots a particle at a splitter which splits the particle into two parts. One part goes towards an observer on the right, the other to an observer on the left, with great distance between the observers, the gun, and the splitter. Each subsequent particle can be observed in one of two ways – according to spin along its horizontal axis, or spin on its vertical axis. If you measure its verticle spin, you can get an answer of up or down. If you measure its horizontal spin, you can get an answer of left or right. Because the two particles come from one split source, if there is an up spin on one, the spin on the other must be down; likewise, if there is a right spin on one, there must be a left split on the other. But there is a catch. You cannot measure both spins at the same time, you have to do one first, then the other. And the observers are too far apart to tell each other whether they look at vertical or horizontal first. b. THE EXPERIMENT: The observer on the left always goes first, and decides at the last minute to observe either vertical or horizontal spin first, then the other. At a time five minutes later, the observer on the right makes the same random choice, and observers either vertical or horizontal. Both write down their results, and after many trials, the two experimenters compare results. When they compare results, they notice some strange things. When the observer on the left, who always goes first, looks at vertical first and gets an ‘up’ spin, the observer on right always gets a ‘down’ spin, no matter if vertical is looked at first or second. But when horizontal is checked, the data only matches half the time, there is a random 50-50 split. That is, whichever axis is checked first (by the first observer) always matches that on the other side, while whichever is checked second (by the first observer) always goes random. That is, the first observation always matches, the second one is always random. c. THE PARADOX: Ok, so if there’s a large distance between the two particles, farther apart than can be covered by light in the time between the readings, how do the two particles coordinate? Do they have walkie talkies? It seems like they are communicating, but if so, they have to be doing so faster than the speed of light, or jumping through some sort of wormhole or other dimension in space. Or, the quantum particles are reading our minds. Or time works backwards as well as forwards for quantum particles. Or all of the above. d. HOW TIME ‘REVERSAL’ FIXES THINGS: If time can ‘work backwards (more on this in our quantum eraser discussion)’, there’s no issue. Go in reverse. You start off with two particles with the two different observers. They start off comparing notes. Their notes come out coordinated. After that, they shoot particles backwards into a gun. Because they are already coordinated, the particles combine nicely, and go back into the gun. Luckily, the only particles they start out with are already coordinated, but that’s because they check first. Everything works out, no paradox. Thus, if time is going to be ‘causally consistent’ backwards as well as forward, only the right particles are chosen when the experiment goes backwards. This means that the experiment going forwards is ensured to work as well. a. PREFACE – REVIEW OF THE DOUBLE-SLIT: There are many ways to set up a quantum eraser experiment, but what I’ve got below is my attempt to give you the simplest setup. The quantum eraser experiment is version of the double-slit experiment with an extra few twists. Remember in the standard double-slit experiment, you first have a single slit, which reduces a set of photons to a single stream, and after this there is a double slit, followed by a plate of photo-sensitive film. We can’t be sure which slit the photons go through, and we see interference/ripple patterns on the plate of film. Because only a single file of electrons can make it through the first slit, however, the only reason why this would happen is that each photon must go through ‘both’ slits, and interfere ‘with itself’. b. NOW, THE TWIST – DETECTORS: But what if we put detectors before the plate with the double slits? If you do this, the detectors will tell us which slit a given photon goes through. After we send a bunch of photons through the experiment with this new setup, we don’t see the ripple pattern on the film anymore. Rather, we just see two piles of blips on the plate, one in front of each slit. That is, because the detectors tell us that the photons go through one slit or the other, they can’t be in two places at once, ‘interfering’ with themselves. The detectors modify what the photons do, and its like the photons seem to ‘know’ we are watching them. Really, through, by detecting the photons before the slits, we modify them, forcing them to choose one slit or the other, so they can’t go in both. That’s why now there’s only two piles of blips on the film, instead of ripples. Its also why scientists say that quantum particles can be in more than one place at a time. c. NOW, THE SECOND TWIST – ERASERS: We can take this all to the next level, to see just how much photons ‘anticipate’ what we’re doing, as if they can also ‘read our minds’ or ‘see into the future’. Let’s put covers on top of the detectors, and a device which can erase the data in the detectors after they are recorded. That way, if we record the data, but then decide to erase it, if photons react differently when we erase the data and when we don’t, then either 1) they can read our minds, 2) they can ‘see’ into the future, 3) they go backwards and forwards in time ‘at the same time’, that is, their time (or at least their sense of cause-and-effect’ is bi-directional, or doesn’t ‘flow’ in one direction. 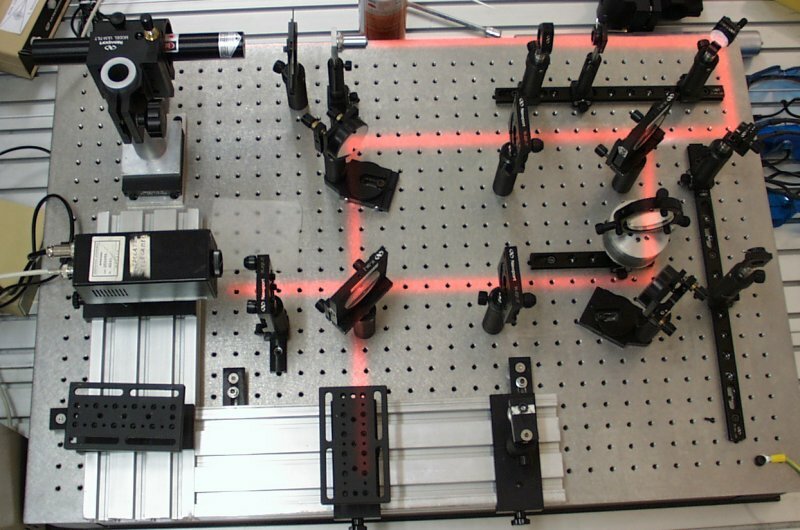 But why do we have to send multiple photons through the experiment for it to work? d. WHY WE NEED A BUNCH: Well, if we send only ONE photon through the device, it doesn’t tell us much. That’s because tiny quantum particles don’t always go where they’re supposed to (remember quantum probability and the uncertainty principle! ), and so you have to send many photons through any version of this experiment to get a pattern, either the ripple pattern or the two-pile pattern. Any single photon could belong to either pattern, only a bunch will tell us which pattern we really have. But how do we make sure that WE aren’t influencing the experiment? That is, what if we have already made up our mind, in one way or another, before the experiment, as to whether or not we’re going to erase the data or not, even if we don’t tell anyone? If we can find a way to get the human aspect out of the experiment, we can make sure that photons don’t ‘read our minds’, but rather, that their time is bi-directional. And that’s what this experiment really aims to show. e. THE FINAL TWIST – RANDOMIZER: Here’s how we do it. Let’s put a randomizer in. Half the time, it erases the data in the detectors so that when we take the cover off, there’s no data there. The other half the time, we find out whether or not the photon went up or down. So what happens when we do this? As we send a stream of photons through the experiment, we see an odd result. We don’t get a ripple pattern, or a two-pile pattern. We get a pattern between the two – a new result. Which means that half the time the photon interferes with itself, the other half it doesn’t, and the reason why can only be one thing – the erasing. But what does this mean? f. THE RESULTS: When we erase the detector data, after it is recorded, it means the photon interfered with itself. When we don’t erase the data, the photon only went through one slit, producing the two-pile pattern. Now, of course, because we used a randomizer, we know that the photon didn’t read our mind – because we didn’t decide after the fact to erase, a computer randomizer did, so this rules out any weird theories that we used psychic ‘influence’ to alter the experiment (and yes, some have proposed this, so its important to rule it out!). So, what then DOES it mean? Photons ‘act’ as if they can ‘see’ into the future. But we know that photons don’t actually ‘know’ or ‘see’ anything, that’s just a way we talk about things to make it easier to understand. g. WHAT IT MEANS FOR US: What does it mean, then, really? That photons, and quantum particles like them, do not exist in a time that ‘flows’ in only one direction. Time for quantum particles is bi-directional, it flows from past to future and future to past. This isn’t to say that the particle goes backwards in time (though some particles do this as well! ), but rather that the relationship of cause-and-effect has to work in both directions. This is what the eraser experiment shows us. This is why something which happens afterwards (erasing or not erasing the data in the detectors) effects something that happens earlier (whether the photon contributes to the ripple or two-pile pattern). h. QUANTUM CAUSALITY: But ok, what’s the difference between the particle going back in time, and its relationship of cause-and-effect being bi-directional? When a particle goes back in time, its like watching a film in reverse. It does everything backwards – and this includes its spin, so if it normally spins up, it now will spin down. And there are particles that do this – or rather, there’s no difference in quantum theory between particles doing some things backwards from each other, and going backwards in time. That is, we can’t tell if they’re opposites or time traveling, and ultimately, it doesn’t make much difference. But what we saw in the quantum eraser experiment is that the relationship of cause-and-effect is bi-directional. This is something different. In our regular world, the relationship of cause-and-effect goes in only one direction. That is, if you put a flame to a candle it will start to burn, but if you reassemble all the parts of the burnt candle, you won’t necessarily get fire as the result. In the quantum world, the only things that happen are those that can go backwards as well without paradox. Or, in simpler terms, if something can’t go in both directions, quantum particles won’t do it. Why is this? i. BEYOND SPACETIME: But why? Much of this brings us back to the difference between particle-time and wave-time. When particles interact with other particles, they are ‘observed’ and change. They become ‘real’ so to speak, and can’t be in more than one place at a time. But when they are acting like waves, between observations, they can be in more than one place at a time (as we saw with the double slit experiment). But here’s what the quantum eraser suggests. When quantum particles aren’t being ‘observed’ or ‘interacting’ with other particles or things, not only can they be in more than one place at a time, but more than one time as well. This is why sometimes scientists argue that quantum particles are ‘smeared’ across an area of space and time (spacetime). Its impossible to fully say where they are, or what time they are in, because it is like they are in many spacetimes at once. Time doesn’t flow for them, which is why cause and effect has to work in more than one direction. For us large, non-quantum things, however, time flows, and so, things only have to work one-way. That’s because we’ve given up the quantum freedom to be in multiple places and times at at ‘time’ . . .
What’s the ramifications of these experiments, particularly for mediology, networkology, and object-oriented/onticological approaches to speculative realism? These experiments cast light on what it means to be an object in spacetime precisely by showing us what it might mean for an object to be beyond these constraints. They show us precisely how it is that by interacting with itself, self-differing substance mediates itself via extension in spacetime. They separate out quite distinctly what it would mean to go backwards in time versus for being outside of time, and how temporal flow and causality are two very different things. All of this sheds further light on what precisely it means for something to be an object. The simplest form of object is the quantum event, which is as such because it is localized in spacetime, of which, in relation to other quantum events, it is co-constitutive. It is here that we see why it is possible to consider time and space as networks, networks of quantum events zipping in and out of spacetime. Larger objects are, of course, networks of quantum events. And as some theorists, such as Julian Barbour have argued, all macro-objects are in fact continually recreated by the flickering of the quantum events of which they are composed jostling amongst each other, continually coaxing each other into localization in spacetime. That is, each quantum event mediates those with which it interacts. Spacetime is the form this mediation takes on a larger, macroscale. As many theorists have argued, time only flows because of the disequilibria of entropy in the universe we know, a residue of the big-bang. As we see for quantum phenomena, however, time only flows in this direction for those in the macroscopic world. Thus, there are in some senses two universes, the temporal and temporally smeared, spatial and spatially smeared, and the universe we know it is continually jumping between these states (even as both are changing due to the supra/temporal evolution of the universe as a whole, what Whitehead calls the ‘creative advance’ of the universe). That said, both of these states are extended, only differently. For in fact, quantum phenomena can only violate spacetime localization within the very strict confines between interacting with each other. And this is why there is talk of smearing. It is not that spacetime is abolished, only that is smeared inbetween events. The difference between smearing and true atemporal or aspatial existence, however, begins to break down as we approach extreme states, such as we see in blackholes, in which extension itself begins to collapse on itself. 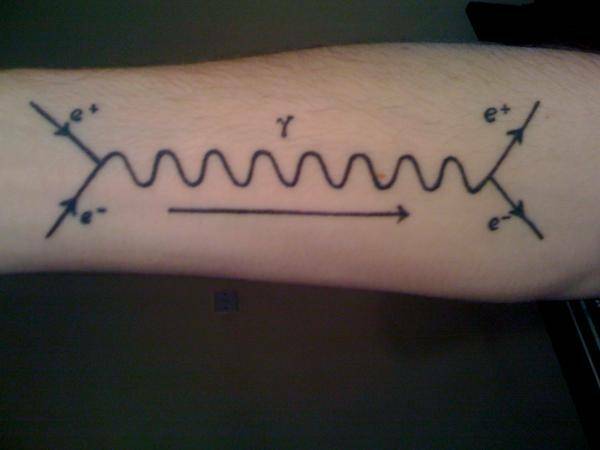 a feynman diagram of a quantum event. notice there are no arrows on the lines to indicate the direction of the flow of time. Of course, there is something which violates the separations in the world that we know as space and time on a regular basis. And that is mind. Thought is able to unite differences across space and time differences. When we see something green, green can describe leaves on a tree that are spatially separated, or the same leaf in different moments in time. Mind is, like the quantum, able to collapse space and time, in a manner which is analogous to quantum smearing. Furthermore, as Whitehead has argued, all quantum events, because they are ‘uncertain’ to outside observers, have a degree of ‘privacy’ to them – that is, they cannot be predicted, there is what seems, at least to the outside observer, to be a fundamental randomness at work here. Whether this is the result of indirect influence of the apprehension of the larger context by a quantum event, or simply a result of limitations of our knowledge, remains the sort of epistemological/ontological distinction we mentioned at the start of this post. But either way, it seems that there is something at least ‘internal’ to each of the most basic objects in the world. That is, there is something ‘like’ mind at work in the most basic objects in existence, something which apprehends the world around it, processes it, and reacts/decides in relation thereto. Even with other human minds, we have little other proof that they exist than this sort of behavior. The result is that quantum mechanics does seem to endorse a quasi-Leibnizian view of the world. There is a windowless ‘monad’ or interior privacy within each basic quantum event, one which seems to resonate with the larger world, but which does not touch it directly. What does touch the world directly is, rather, the physical object that corresponds to such a monad (what many commentators on Leibniz have referred to as a monad’s ‘body’, to which it is connected by what Leibniz calls the ‘viniculum’). While Leibniz argued that matter is infinitely divisible, and quantum theory postulates smallest parts (quanta) to the universe, even this seems to recently confirm Leibniz more and more. For as we build machines that can test the limits of quantum phenomenon at higher and higher energies, matter appears increasingly divisible. That is, the size of the quanta in question get smaller. Thus, we now know that many of what we once considered ultimate particles, such as protons, are in fact composed of quarks, and these very quarks, when cut apart, turn into ‘jets’ that reform into whole quarks – like earthworms, they split and regenerate. Whether or not all matter can be divided infinitely is something we’ve yet to truly tell. But for us, it can at least be considered functionally infinitely divisible. And the large majority of the other Leibnizian intuitions about the physical world hold as well. Either way, all matter can thus be said, in a sense, to possess something like mind or proto-mind, depending on how you define mind. And from such a perspective it becomes much less problematic to wonder how it is that matter ’emerges’ seemingly spontaneously from mind (and it is this issue which I address at length in my forthcoming manuscript The Networked Mind). That is, there’s something like the potentiality for what we call mind (and perhaps other types of mind as well), all the way down to the very bedrock of what we know as matter, namely, the quantum event. What then of mind? It is perhaps an echo at a higher level, or an actualization of a virtuality present within all matter. And it is fundamental to what any notion of object today might mean. And in this sense, the emergence of what Levi Bryant calls an objecticle from its field can be seen in the emergence of a quantum event from its field – and into spacetime. For it is via objects that the world is medium to itself. ~ by chris on November 28, 2009.